The holidays have officially begun. Did you have a nice Thanksgiving yesterday? Please share it; I’d love to get more last minute Thanksgiving holiday tips for next year. We had a wonderful Thanksgiving feast yesterday. Rather than sharing Thanksgiving with family (as they live across the water from here), we invited our British neighbors over and shared our Thanksgiving tradition with them instead. It was a great success. They were so open to the experience and genuinely interested in the American heritage that it all entails. But, I have to say, it was a bit much and I feel a bit exhausted, even though we are just at the beginning of the Holiday season. Cleaning, organizing and decorating the house plus cooking the entire meal myself for so many guests (Typically, the Brits are not familiar with American-made pumpkin pie and cranberry sauce, so I decide that they should just bring themselves), have me sit here with at my computer with a full-on cold. 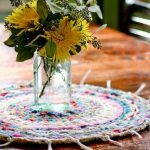 So, to stop this feeling of exhaustion in the bud, I’ve done some reflecting and am sharing 10 little life hacks that are designed to de-stress my life and the lives of other moms, homemakers and everyone else responsible for running the house cozy and entertaining the guests. Are you ready for some tips to relax a bit now?!! The first tip is to bookmark/pin THIS PAGE, so you can came back to it all season long. Make a list, and cross it twice. This may sound like an obvious, but do you have a list ready for everything, yet? Begin today. 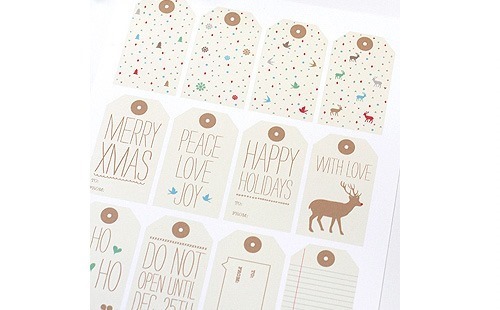 Here’s a FREE Gifts Planner! IT’S a FREE phone app to keep track of wishes, gifts bought and budgets. It’s excellent!!!! Download it now, and start populating it right away with all your Black Friday – Cyber Monday Deals (This link is updated with new deals throughout the days of the SALES!). 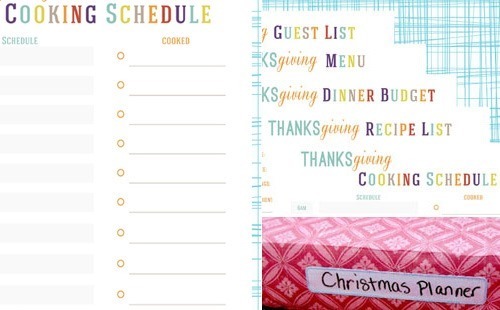 Plus a free paper-based Thanksgiving planner (pin it to re-purpose it for your Christmas party, or for next year). My way of making soup: take one or two matching veggies. Wash and clean. Add oil to a pot, smashed garlic and a slivered onion. Wait till roasted. Add the washed veggies. Add a handful of (frozen) bacon bits. Add 2 liter of water. Bring to boil. 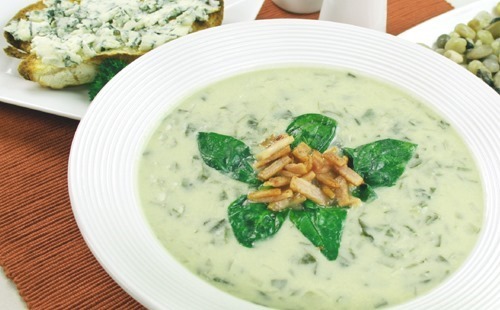 Serve with a little bit of cream mixed in and some fresh herbs for topping. Offer parmesan as a sprinkle. Serve with crusty bread. And that’s it, folks. A crowd pleaser! Always works. 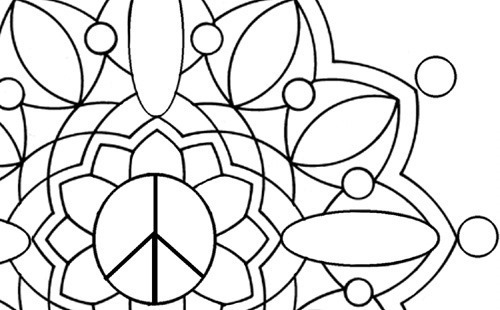 Here are some seasonal free coloring pages to keep kids busy, for when they have to wait in the car, or get bored during a dinner party, or just want something to do. Classic Christmas videos are also a winner – be sure to have one handy. As are favorite board games, and a box with latest toys, such as loom bands, etc, to keep bored hands and minds busy and entertained. The holiday season season is also filled with great opportunities to give small or big gifts to neighbors, friends and family. Making a homemade gift is thoughtful. It’s nice if you get to add a pretty giftwrap to it as well. Just prep that last step by having matching gift boxes, wrapping paper, gift tags, and greeting cards all ready to go. Does gift wrapping paper drive you crazy? Here’s a tip: use cut-open toilet paper rolls around wrapping paper to keep prevent the wrapping paper from unrolling. Divine recycling idea! Set the mood for Thanksgiving, Hanukkah, or Christmas with some simple home décor style solutions. Add some cozy, Fall/Winter themed throw pillows. Knit pillow can be made easily from recycled sweaters. 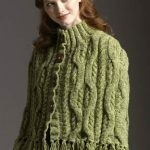 However, if you’d like to crochet a pretty crochet cover for the season, here’s a free crochet pillow pattern. The mantel is another one of those locations that’s easily updated with a holiday theme. Here are some ideas for you. 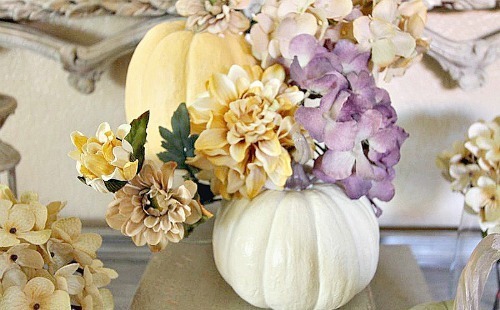 Tammy, our home decorating guest writer created darling DIY fall decorations in 15 minutes. Earlier, she made this mantle with hydrangeas and faux pumpkins in a whim. Make your guests (and your house hold members) each a pair of slippers. People with cold feet are crankier. I am not sure if that is scientifically proven, but I can tell that it is so from experience. Here’s a still- Easy knitting pattern for wonderfully warm house slippers | sleep socks. 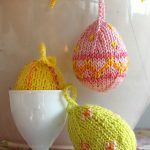 If knitting is not your thing, consider getting 10 pairs from Ikea or some place like that for inexpensive. Or make a generous donation at a craft fair and pick a bunch of handmade house socks. I know some of you will have a fancy dinner gathering, but most of us have casual family affairs. This suggestion is for the latter, of course. Particularly if you have sleepover guests, house socks are the best! 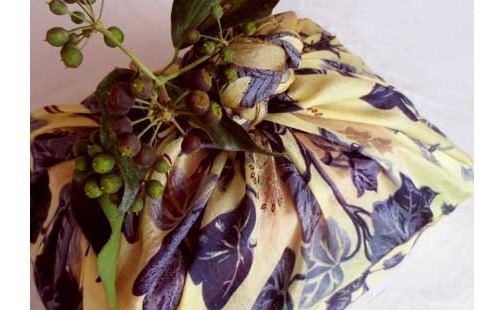 A recycled silk scarf becomes high-end Japanese gift wrap. Start saving nice looking and useful food containers as soon as the holiday season starts. Then, when you have cookies to give away, or leftovers from the big turkey meal, you have ‘makeshift’ Tupperware that needn’t return to your household. Better still, if you have them stacked and ready, bring them to your gift wrapping station, and dream up some fun labels for them, ahead of time. Gift giving gets better all the time this way. Other useful recyclables tend to include toilet paper rolls, soup cans, paint strips, last year’s Christmas cards and recycled wrapping paper. This solution will result in more creative gift wrapping and help you mind your budget so that there’s something left for charity at the end of the day. Having babies and toddlers come over this holiday season? 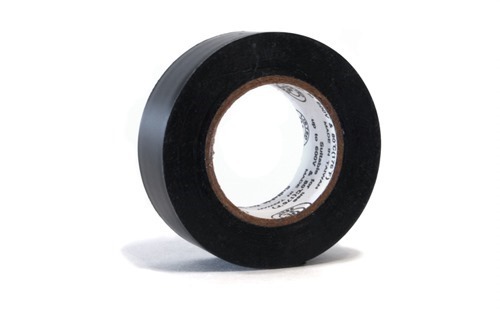 Walk through your home with some durable tape and cover all electricity outlets with tape just before they arrive. (Sigh of relief.) Keep babies and toddlers insight anyway and let them play right in front of you. But at least you can relax a little bit more. Having a toy box ready with old toys of your kids is also a stress relief. Ensure age appropriateness. Seriously. Take a Sharpie, some labels and 12 large baskets, boxes or bags, and go through the house. Remove 20% of the objects in sight that are not necessary. Put them in the boxes/bags and add a label to each basket or bag with what’s in them/which room they belong to. Store them in the attic till January. That way you’ll have space for the holiday décor and extra luggage from guests, the muddy boots and bulky jackets, etc. 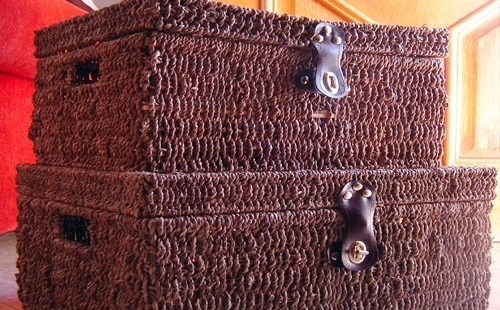 Tip: this project can also benefit from some empty suitcases and put them to good use. You can also simply store things out of sight, but within reach, in these pretty organising baskets. First of all, be sure to re-use last year’s holiday decorations, albeit that you may wish to freshen things up. That’s where ‘homemade holiday décor ideas come in. Here’s how to make a Fall wreath for the mantel, that can be put together in 15 minutes. 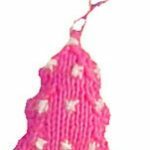 And there are lots of free tutorials and knitting patterns for hand-knit ornaments, for felt ornaments and alphabet ornaments (made with recycled sweaters) for your Christmas tree. Re. 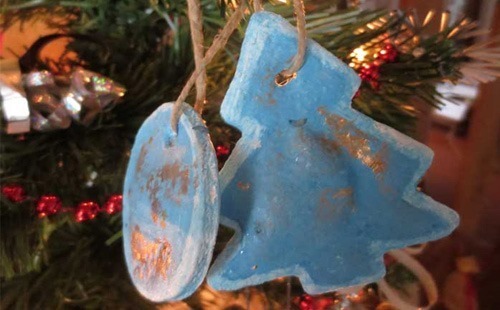 the Christmas ornaments in the picture: I made these blue ones last year from salt dough and gave them away as gifts in sets of two, adorning chocolate boxes and other little sweet gifts. There is something so soothing, relaxed and homey about handmade holiday decorations. 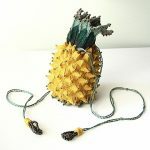 When things are homemade, they carry the energy and thoughtfulness of the maker. As well, they don’t have to be perfect, meaning that you don’t have to perfect either, and that thought is already relaxing. 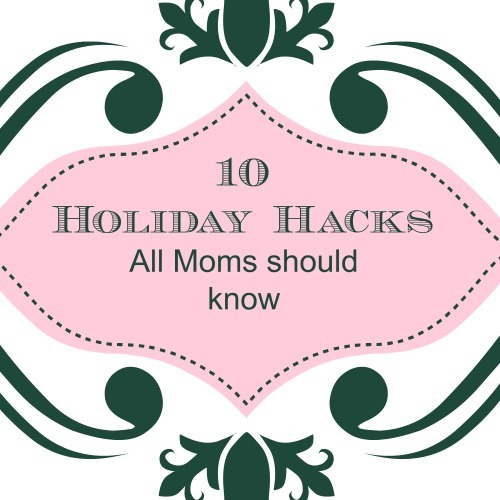 I hope these 10 hacks will keep your holidays a little bit more relaxed and enjoyable! You are right, Angela! Things sure are more fun when you are prepared. THEN you can be spontaneous, take advantage of life’s synchronity, and things fall easily into place. Fabulous post! Pinned and tweeted. Thank you for being a part of our party. I hope to see you on tonight at 7 pm. It wouldn’t be a party without you!